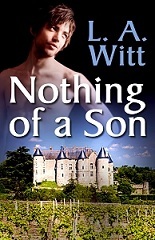 Nothing of a Son is now available from Amber Allure! This fantasy novella is part of the Forbidden Liaisons Amber Pax, along with stories by A.J. Llewellyn, Carolina Valdez, Angel Martinez, and D.J. Manly --- the stories can be purchased individually, or together on the Amber Allure website. When a storm forces traveling soldier Daedalus to seek shelter, a wealthy duke takes him into his home. The only condition? Stay away from the duke’s daughters.